Samuel Levac-Levey always had an idea, but never had a way to bring his idea to life and make his dream a reality. That was until he went into Dr. Cliff Johnson’s, an engineering professor at Dalhousie’s, office one day and found out about the IDEA Sandbox boot camp. In 2015, Levac-Levey was in his first year of mechanical engineering at Dalhousie and had gone to Dr. Johnson’s office after class to ask him about something. After answering his questions, Dr. Johnson saw something in Levac-Levey and suggested for him to participate in a new boot camp that he and a few other instructors were hosting called the IDEA Sandbox. After hearing about this, Levac-Levey decided to join because he had a previous interest in entrepreneurship and had an idea for a project that he thought could get started on from participating in Dr. Johnson’s boot camp. Three years later, Levac-Levey prepares to graduate from Dalhousie in May with a degree in mechanical engineering, and has his idea of creating a river hydrokinetic turbine is in the testing stage of development. While back in the IDEA Sandbox, Levac-Levey and the rest of the participants were tasked with designing and creating a wind turbine that had to be different than those already on the market. While some participants tinkered around with minor details to make their versions different, Levac-Levey went way outside the box and discovered that his idea would be better tailored for a river turbine than a wind one, and began to explore that idea. Dr. Johnson saw potential in the idea and hired Levac-Levey for the summer to work on his idea after the six week boot camp was finished. At the end of the summer, Levac-Levey had turned his river hydrokinetic turbine from an idea to a beta-prototype that could produce electricity, which he could test. Though the project was not complete at the end of the summer, Levac-Levey quickly got caught up with school and all of the work that comes with being a full time student, and his project had to be shelved for a few years to focus on getting his degree. Now that he is mere days away from receiving his degree, Levac-Levey plans on getting right back to working on his river hydrokinetic turbine with the hopes to one day be able to bring it to market. Back in 2016, Bronya Meharg was working as a designer for a toy company that she had been at for the past six years. Meharg, a graduate of NSCAD University with a degree in design, liked the position, but knew that it wasn’t what she wanted to do with the rest of her life. It was around this time that one of Meharg’s former NSCAD instructors, Glen Hougan, called her to tell her about the IDEA Sandbox boot camp that was about to begin its’ second year. Meharg had never heard of the boot camp before, but decided to trust her old instructors and participate in the six week long program. “It was an opportunity to get myself back out there and try to find what it is that I wanted to do with my career,” Meharg said. During her time in the boot camp, Meharg worked on a variety of different projects and was exposed to a lot of different ways to look at an issue because she had been working with students with engineering and business backgrounds. Not only did Meharg like working with other students, but she also enjoyed working with Cliff Johnston, engineering professor at Dalhousie, and David Roach, business professor at Dalhousie, because of their unique perspectives as well. Almost three years has passed since Meharg has finished the boot camp, and she is no longer a toy designer, but instead has found her true calling – designing products for a pharmaceutical company that helps residents in Nova Scotia. Meharg never had an interest in this field of design until she was in the boot camp and her group was tasked with creating a product to help those living with physical disabilities for their final project. After designing a coffee cup that was easier to hold for people with arthritis, Meharg said she knew right then that she wanted to use her knowledge and skills in design to help solve real-life issues for people. Sidney Klein had always planned on becoming an entrepreneur ever since he was a child. Klein always had an interest in becoming his own boss, so he applied for the Bachelor of Management program at Dalhousie University in 2016, with his major being in entrepreneurship and innovation, and has been working on obtaining his degree ever since. Klein has been working as a representative for his parent’s real estate company in Halifax to help give him some experience of what it’s like to run your own company. But even with that experience, Klein was still looking for something else that would help give him the skills to become an entrepreneur. That’s when his friend Emilio Marcovici told him about the IDEA Sandbox boot camp. Marcovici is also a business student at Dalhousie, and had already applied for the boot camp himself. But told Klein because the boot camp was still looking for other business students. “It seemed like a rare opportunity, that could be good for me. So I decided to sign up,” said Klein. During the six-week boot camp, Klein worked on a variety of projects involving product design and design thinking. Whether it was designing a new board game that could be taken to market, a innovative home-feeder for a pet rabbit, or trying to come up with a safer barbeque cleaner, Klein had to use his business and entrepreneurial skills to help create to best possible solutions for these projects. Klein wouldn’t be alone trying to come up with these solutions though, as he had to work in groups with engineering and design students. This aspect of having to collaborate with other disciplines was one of Klein’s favourite parts of the boot camp, he said. Looking back at the boot camp, Klein said it helped him sharpen his entrepreneurial skills and learned about how to work well with other disciplines. Sidney Klein, middle, presents his idea for a new board game to his instructors and fellow IDEA Sandbox participants. At the beginning of the second week of the IDEA Sandbox boot camp, the participants were broken up into small groups of three or four. They would be working with those teams for the next two weeks on a variety of projects and ideas, with the major project being that the groups design and create a new board game. 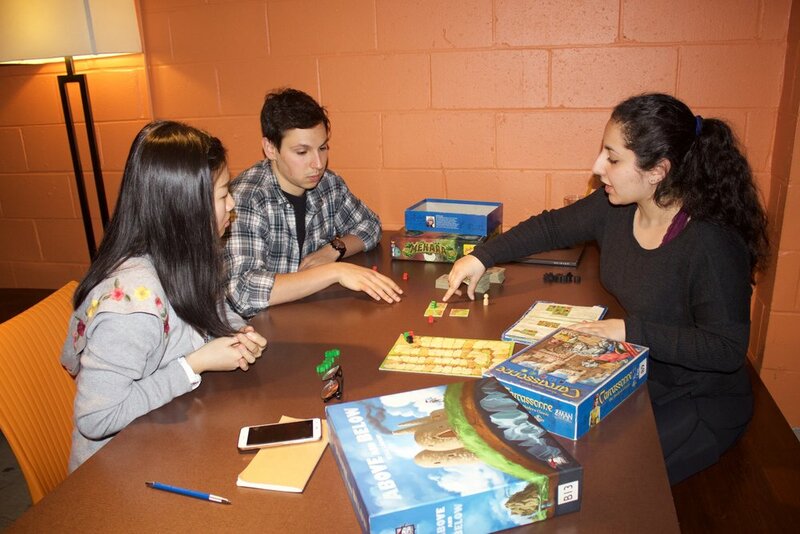 On May 7th, to inspire the students, the instructors brought them to the Board Game Café on Barrington Street, and arranged for the participants to talk to the manager about the different types of board games. Kris ­Moulton is the manager of the Board Room café in Halifax, as well as one in Bedford, and owns hundreds, and hundreds of board games from all over the world. Kris talked to the student about the history of board games, and about the recent revival of board games in North American society over the past 10 years. Kris also discussed about the different types of board games, from competitive to cooperative, to dice games, to fantasy, and everything in between, all of which to help spark the creativity in the students for their own ideas. After Kris was done, the students picked out a couple of board games and played them with their group members. This was a great start of the week exercise for the participants because, it exposed them to a variety of different types of board games, which helped them begin to brainstorm idea about what they wanted to include in their board game. Also, the trip was good icebreaker for the group members and allowed for them to get to know each other, and build a bit of group chemistry before they began working on their project together. 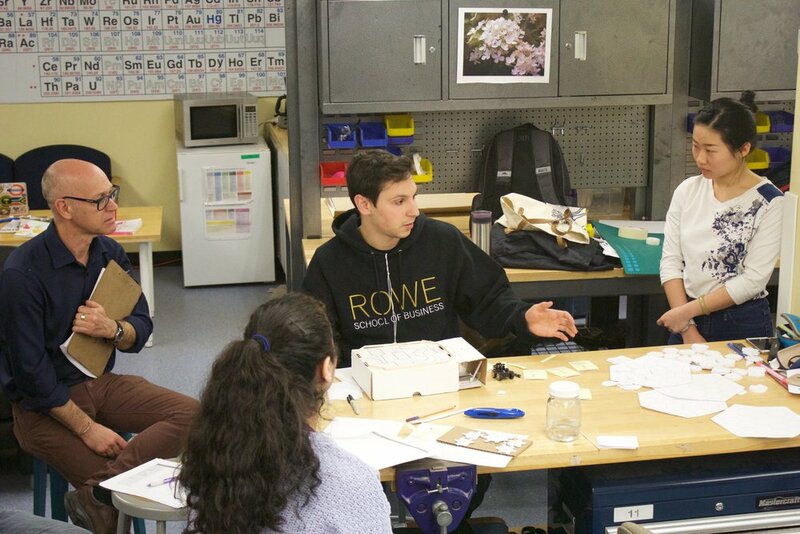 Nour Houdeib, right, explains to her group members the instructions to the board game "Above and Below", while at the Board Room Cafe on May 7th. For Heather McIntosh, the IDEA Sandbox boot camp gave her an opportunity to put her design skills to the test. The first year interdisciplinary design student from NSCAD University was told about the boot camp from one of her professors, an applied for the six-week long program because she wanted to be challenged. Throughout the boot camp, McIntosh had to work on a variety of different problems that had to be solved with new, and innovative, product designing. This could be something as simple as creating a new self-feeder for one of the instructor’s pet rabbit, or could be something a little less simple – like creating and designing an interactive device that students with ADHD can use to stay focused in the classroom. McIntosh wasn’t alone while working on these projects, as she was put into groups with other students in the boot camp who were form other educational backgrounds. This opportunity to work with engineering and business students was one of her favourite aspects about the boot camp, McIntosh said. Another reason why working with multidisciplinary groups was one of her favourite aspects of the boot camp was because of the communication skills is forced McIntosh to develop. From having to constantly keep everyone in her group updated with what’s she’s doing on the project, to having to talk with teachers and students to gain research about her final project, McIntosh was forced to out of her comfort zone and it thankful of it, she said. Heather McIntosh, left, presents her idea for a new card game to her instructors and fellow participants at the 2018 IDEA Sandbox boot camp. Jack Mahody wouldn’t know what the IDEA sandbox boot camp is without the help of his sister. Mahody, a first year commerce student at Dalhousie, wanted to strengthen his product design skills and learn more about the subject but there was not any available courses at Dalhousie for him to take. That’s when his sister suggested to him that he apply for the IDEA Sandbox boot camp, which she had done the year previous. The six-week long boot camp had Mahody work on a variety of projects and designs with other business students, as well as students from engineering and design. This ability to work with other disciplines is another main reason why Mahody applied for the boot camp. Mahody’s two main projects in the boot camp were the board game, where he and his team created a strategic puzzle game called “GEMS”, and his final projects, where he and his team design and create a new, innovative, object that would help children with ADHD focus in the classroom. From working on projects like this, and being tasked with bringing an idea to life, Mahody said the knowledge and skills he took away from the boot camp is going to stick with him. When asked his he would suggest the IDEA Sandbox boot camp to other students, just like his sister did to him, Mahody simply just nodded his head. Jack Mahody, left, presents his idea for a board game to his instructors at the IDEA Sandbox boot camp. Emily MacRitchie could always see herself becoming an entrepreneur once she was done obtaining her mechanical engineering degree from Dalhousie University. “I already have the problem solving skills and the design ability to become an entrepreneur in the future, so why not,?” she said. MacRitchie understands that in order to become a successful entrepreneur that she’d have to become more well-rounded and improve on her business skills. But unfortunately for her, there are not a lot of opportunities for her to improve those skills as engineer students do barely any business courses throughout their degree, she said. Luckily for MacRitchie, she stumbled across an opportunity. While sitting in her design lecture one day, Dalhousie mechanical engineering professors and IDEA Sandbox instructors Clifton Johnston and Holly Pharaoh came to talk to her class about the boot camp. After hearing that the boot camp not only included other engineering students who are at different points of their degrees, but also included business and design students, MacRitchie was in. Throughout the six week long boot camp, MacRitchie worked in groups with business and design students on a variety of different projects, including creating a collaborative card game called “Bomb Disposal Unit” and her final project where her group had to design a new ergonomic diaper bag for today’s parents. From this, MacRitchie said her business sense has improved drastically since she started the boot camp and her dream to become an entrepreneur is slowly becoming her reality. Emily MacRitchie, left, presents her idea for a board game to her instructors at the IDEA Sandbox boot camp. For Florent Herbinger, participating in the 2018 IDEA Sandbox boot camp was the best job that he ever had. Herbinger recently graduated from Dalhousie in April with a bachelor of science and sustainability, as well as a diploma in engineering, and was only looking for a job for a few weeks until he moves to Montreal in July to pursue his Masters in engineering. Throughout the six-week long boot camp, Herbinger worked on a variety of different ideas and projects, including design and creating a board game for his second final project. Herbinger and his group created a strategic tile-laying game called ‘GEMS’ where players must compete against each other to collect tiles and create patterns. This whole project was one of Herbinger’s favourite aspects of the boot camp, he said. Another one of Herbinger’s favourite aspects of the boot camp was the in-depth knowledge he received about product design. Herbinger said he never really considered integrating product design into his studies before but is something he’s going to be more mindful of moving forward. Herbinger said he was really impressed with the boot camp, as it surpassed any expectation he had for it, because he never knew what he was getting himself into every morning as he walked into the classroom. Florent Herbinger (right) presents one of his prototypes for his final project at the IDEA Sandbox boot camp.